Sonoma State University sports update April 27-May 3. Softball knocked out of CCAA Tournament, but snags bid into NCAA Tourney; water polo boasts eight postseason awards; and men's golf team records two all-conference honors; baseball splits two doubleheaders with Stanislaus. 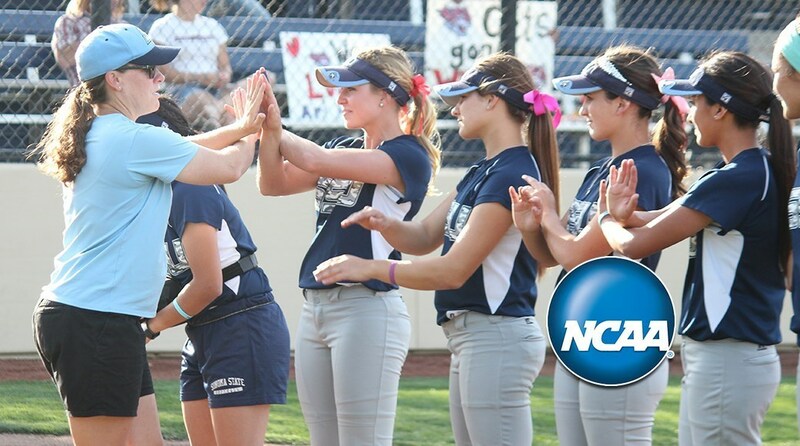 For the eighth straight season, the Sonoma State softball team has qualified for the NCAA Division II Softball Championship Tournament. The Seawolves will enter the West Regional as the No. 8 seed and head to Arcata where No. 1 seed Humboldt State serves as the host of the West 1 Regional. Sonoma, which finished third in both the CCAA regular season standings and in the CCAA tournament and sports an overall record of 33-22-1, will face off with the top-seeded Lumberjacks (45-5-1) in the first round of the double-elimination tournament May 5 at 3 p.m.
Senior pitcher Amanda Llerena was named First Team All-California Collegiate Athletic Association (CCAA) for the third consecutive year to highlight an impressive Sonoma State contingent on the 2016 all-conference team. Carlie Daniel and Alee Balanon were named Second Team All-CCAA while Sarah Langley, Jena Kaser, Alison Strycula, and Jordann White picked up Honorable Mention recognition. Llerena, a senior from San Jose, has been one of the top pitchers in the conference all season long. The team's leader in all pitching categories, she is 20-9 with a career-best 1.63 ERA in 2016. She has 165 strikeouts and has tossed five shutouts and 22 complete games, ranking in the top four in the CCAA in all meaningful pitching statistics. Llerena is a two-time CCAA Pitcher of the Year, earning the nod after her sophomore and junior seasons. Carlie Daniel ripped a two-run double in the fifth inning and Sarah Langley hit a solo home run in the sixth, but the Sonoma State softball team couldn't overcome an early five-run deficit in a 5-3 loss to No. 14 Chico State in the opening round of the CCAA Championship Tournament April 29 at Arnaiz Stadium in Stockton. The Sonoma State softball team chopped down mighty Humboldt State earlier in the afternoon, effectively eliminating the top-seeded Lumberjacks with a 4-2 victory, but the Seawolves couldn't rally from another early deficit against Chico State a couple hours later on April 30 in a 6-4 loss that eliminated Sonoma from the CCAA Softball Championships in Stockton. A program-record eight postseason awards were handed out to six different Seawolves who made the 2016 Western Water Polo Association (WWPA) Women's All-Conference Team: Noelle Herrera (First Team), Kaysie Lewis (Second Team), Carleigh Robinson (Second Team), Taylor Plorin (Honorable Mention, All-Freshman), Lyndsie Williams (Honorable Mention, All-Freshman) and Amanda Weddle (All-Freshman). For the second straight year, the No. 2 seed Sonoma State women's water polo team faced off in overtime with No. 3 seed Cal State East Bay in the WWPA Women's Championship semifinals, but it yielded the same result as the Seawolves ran out of gas in the extra period, suffering a 12-9 loss to the Pioneers on April 28 at Chabot College in Hayward. Noelle Herrera wrapped up her collegiate career on a high note, throwing in four goals to lead the Sonoma State women's water polo team to a third place finish in the 2016 WWPA Women's Championships at Chabot College in Hayward with a 7-5 victory over Mercyhurst on April 29. The Seawolves end their season with a 13-14 record, and with the third place finish, they match their best-ever finish in the conference since the program's inception in 2004. Herrera and fellow senior Kaysie Lewis were named to the All-Tournament First Team, and teammate Ellen Peterson was selected to the All-Tournament Second Team. Senior Brandon Lee and junior Justin Shluker have been selected to the 2016 All-California Collegiate Athletic Association (CCAA) Men's Golf Team. Lee, a native of Alpharetta, Georgia, earns all-conference honors for the third consecutive year. His stroke average of 73.36 this season ranks just behind Shluker's team-best mark. Shluker, who hails from Park City, Utah, leads the team with a 73.24 stroke average this season and has been in the top 10 in six tournaments. The awards mark the 12th consecutive year that Sonoma State has had at least one golfer on the all-conference team. In the race to overtake Cal State East Bay for a spot in the CCAA playoffs, the Sonoma State Seawolves began a four game home-and-home series with Cal State Stanislaus on April 30, earning a split with the Warriors. In the opener, a two-run home run by Grant St. Martin and a big day at the plate from Tyler Glenn helped the Seawolves to a victory. The doubleheader finale was scheduled to go only seven innings, which made the Warriors early offensive burst against Ricky Clark and Wade Berryhill make the game even shorter. A day after splitting two games in Turlock, the Sonoma State Seawolves welcomed the Stanislaus State Warriors for two games on May 1, trying to keep pace with Cal State East Bay for the last North Division spot in the CCAA playoffs. Behind a tremendous pitching effort from Cal Becker and some extra-inning heroics from Trevor Abrams, the Seawolves won a nail biter in the opener before the Warrior offense woke up in the early innings of game two, earn both teams a split of both the action on Sunday and the weekend's four-game series.